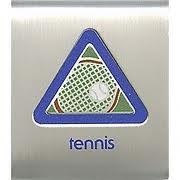 Explain the rules of tennis to your leader or adult partner. Spend at least 30 minutes practicing tennis skills. Participate in a tennis game. Practice for 30 minutes developing forehand techniques through forehand bump-ups with a bounce, partner bump-ups with a target, forehand alley rally, forehand alley rally over a "net," drop-hit forehand bumps, drop-hit catch in pairs, and toss-hit catch in pairs. Practice developing serving skills for 30 minutes.